Stuiter; Silver/Grey; Introduction to 2nd Coming; 2nd Coming of Homunculus; Do You Know Ben van Gelder? ; Guiding Principle, Palace; In Retrospect; Smooth Jazz Apocalypse; The Dramatic Demise of Princess Discombobulatrix. 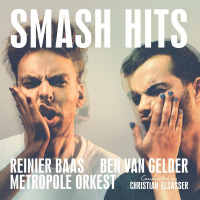 Reinier Baas: guitar; Ben van Gelder: alto saxophone; Metropole Orkest conducted by Christian Elsasser.